DALLAS – Day in and day out, Soldiers, Airmen and their families have real-life proof that superheroes exist. 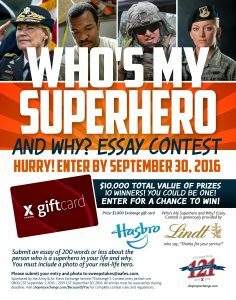 The Army & Air Force Exchange Service, Hasbro and Lindt Chocolatier are giving military shoppers a chance to tell about their real-life superheroes for their share of $10,000 in prizes. In the Who’s My Superhero And Why contest, which runs from Sept. 1 to 30, Exchange shoppers can submit an essay and photo about their real-life superhero. Ten winners will each receive a $1,000 Exchange gift card. The worldwide essay contest is part of the Exchange’s 2016 Because of You program, which celebrates military families and honors active-duty troops, allowing the Exchange to express gratitude for their service and sacrifice. To enter, authorized Exchange shoppers 18 and older can send essays of 200 words or less to sweepstakes@aafes.com. A photo of the real-life hero must accompany the essay. Entries must also include the contestant’s full name with middle initial; sponsor’s name, rank and branch of service; date of birth; mailing address; email address; and phone number. Entries are limited to one per person. Winners of the Who’s My Superhero And Why essay contest will be notified by Oct. 30. DALLAS – LATINA Style magazine has named the Army & Air Force Exchange Service one of the 50 best companies for Latinas to work, once again highlighting the Exchange’s commitment to diversity in the workplace. The Exchange’s selection to the 2016 LATINA Style 50 was published in the magazine’s special August issue. Exchange Executive Vice President & Chief Merchandising Officer Ana Middleton will represent the Exchange at the magazine’s awards ceremony and diversity conference in Washington, D.C., early in 2017. The Exchange has consistently been highlighted by LATINA Style 50 since 2008. The Exchange was recognized after evaluation of more than 800 companies. The magazine’s annual rankings are considered a respected source of information for Hispanic women across the country. DALLAS – Shoppers with the Army & Air Force Exchange Service have the chance to get a taste of off-road action with their very own Polaris RZR desert vehicle this fall. 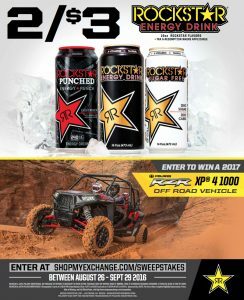 From Aug. 26 to Sept. 29, authorized shoppers worldwide can enter the Rockstar Polaris RZR sweepstakes at shopmyexchange.com/sweepstakes. One lucky winner will receive a Polaris RZR XP 4 1000 off-road vehicle valued at $22,299. The Rockstar Polaris RZR sweepstakes is open to authorized shoppers 18 and older. No purchase is necessary to enter or win. A winner will be drawn on or about Oct. 7. 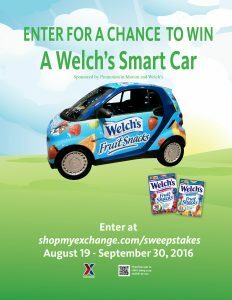 DALLAS – The Army & Air Force Exchange Service is teaming up with Promotion in Motion to put one lucky military shopper in the driver’s seat of a brand-new Welch’s Smart car. From Aug. 19 through Sept. 30, authorized shoppers worldwide can enter the Promotion in Motion Sweepstakes to win the Smart car, valued at $15,000. Shoppers 18 and older can visit shopmyexchange.com/sweepstakes to fill out the sweepstakes entry form online. No purchase is necessary to enter the Promotion in Motion Sweepstakes. The prize drawing will occur on or about Oct. 7. 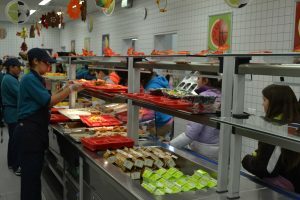 DALLAS – The Army & Air Force Exchange Service will implement several improvements to its overseas school lunch program this year. Parents can go to MyPaymentPlus.com for more information about the app. The new menu will be released soon and will be available through local schools. JOINT BASE SAN ANTONIO-RANDOLPH – A military retiree from Victoria, Texas was presented with a $5,000 Exchange gift card at the Randolph Exchange on July 22. Martin Kocian, who served in the Army Reserve for 24 years before retiring at the rank of Sgt. 1st Class, was picked at random to win the Army & Air Force Exchange Service’s Promotion in Motion sweepstakes from nearly 20,000 entrants last month. While Kocian said he regularly enters Exchange contests, the $5,000 gift card is by far the most valuable prize he’s won yet. Kocian said he and his wife, Geneva, have simply been spending the card as they go – though he wants to make sure he has enough left over to buy a diamond ring for Geneva. 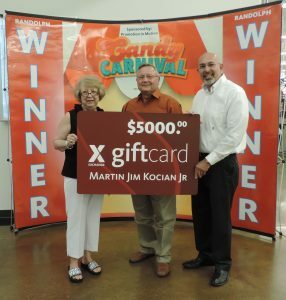 Larry Salgado, general manager of the Randolph Exchange, said the Exchange is happy to provide shoppers like Kocian with the opportunity to win such valuable prizes. 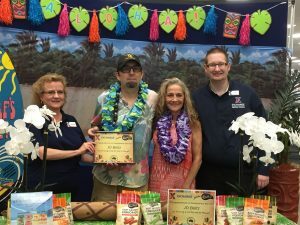 BARKSDALE AIR FORCE BASE – A 30-year Army veteran was presented with a vacation prize package worth more than $5,000 on July 30 at the Barksdale Exchange. Jimmie Williams, of Shreveport, La., was selected at random from more than 12,800 Army & Air Force Exchange Service shoppers worldwide who entered to win a stay at one of more than 2,000 resort locations worldwide plus a Samsonite Silhouette Sphere 2 two-piece luggage set, Sony a6000 mirrorless camera and $2,500 Exchange gift card. Williams, who served one tour of duty in Iraq from 2003 to 2004, retired in 2012 at the rank of Sergeant Major. Today, he works for the Louisiana Department of Veterans Affairs in Bossier City, Louisiana. “When I got out of the Army, I wanted to do something that’s important, worthwhile and has meaning to it, and assisting veterans definitely fits that requirement,” he said. 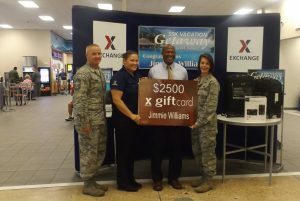 Ellen Henderson, Exchange manager, said Williams is more than deserving of an all-expenses paid getaway courtesy of the Exchange. DALLAS – As a high school senior, Ashley Weston had one last chance at turning good grades into big rewards with the Army & Air Force Exchange Service’s You Made the Grade program. In her final semester of eligibility, her persistence finally paid off. The 18-year-old took home the top prize in the Exchange’s semiannual sweepstakes, part of a program to reward military students for academic success. 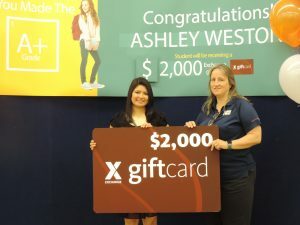 Ashley received a $2,000 Exchange gift card during a presentation at the Joint Base San Antonio-Randolph Exchange on July 25. The prize comes at the perfect time. Ashley starts college this fall at Texas State University in San Marcos. With her winnings, she plans to buy a laptop and other supplies needed to start her college career off on the right foot. Ashley had been entering the You Made the Grade sweepstakes for years. Her father, retired Master Sgt. Darrell Weston, served in the Air Force for 24 years, retiring in 2011. The worldwide sweepstakes also awards second- and third-place prizes. The West Point Exchange awarded a $1,500 gift card to a high school student. Third place, a $500 gift card, was presented to fourth-grader Logan Hicks at the Selfridge Air National Guard Base Exchange. Logan’s father, Capt. Wayne Hicks, has served in the Army for 13 years. FORT POLK – When 10-year Army veteran J.D. Beltz entered for the chance to win an all-expenses-paid trip to Hawaii through the Army & Air Force Exchange Service, he never thought in a million years he’d be the one to win. Beltz, a medically retired Army sergeant and Desert Storm combat veteran living in Leesville, La., was selected from more than 16,000 Exchange shoppers who entered the Darrell Lea/Lucky Country sweepstakes. He was formally presented with his prize during a ceremony on July 29 at the Fort Polk Exchange. Fort Polk Exchange General Manager Beth Pritchard said the Exchange couldn’t be happier to present the prize to someone who has sacrificed so much in the name of protecting American freedoms. Beltz said he wants to send a message to the 22 service members who every day take their own lives – it gets better. MOODY AIR FORCE BASE – For Air Force Capt. Kurt Cloutier, the Army & Air Force Exchange Service’s Refresh, Win and Ride sweepstakes came along at just the right time. Having sold his motorcycle a couple of years ago, Cloutier was starting to get the itch for a new bike. With a brand-new chopper somewhat outside of the family budget, his wife began entering several motorcycle-centric sweepstakes. With Cloutier skeptical they would win anything, it’s easy to imagine his surprise when the Exchange contacted him to say he’d won a Harley-Davidson Sportster Forty-Eight. He was selected at random from more than 11,400 entrants. 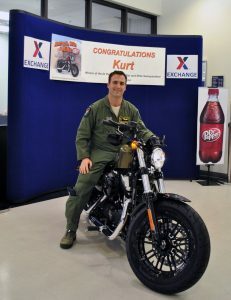 Cloutier rode the motorcycle out of the Moody Exchange on Aug. 5 following a ceremony attended by Col. Thomas Kunkel, 23d Wing commander. Cloutier commissioned into the Air Force in 2009, attending the United States Air Force Academy, Colorado. A fighter pilot specializing in the Thunderbolt A-10C, Cloutier most recently flew in Europe in support of Operation Atlantic Resolve. The Exchange couldn’t be more proud to present the prize to a warrior and patriot such as Cloutier, said Stephanie Wilson, general manager of the Moody Exchange.